Like Duel, Jaws begins with a black screen. We hear something, distantly – it might be birds, or children playing, or screaming. Then the scene fades up underwater, and Williams’ ominous scoring begins – a simple alternation between two bass notes, picking up speed as it continues. The music stops and the scene shifts to the beach, where teenagers are gathered around a bonfire (the setting and their guitars are another echo from Amblin’.) A girl persuades a boy to chase her, shedding her clothes as she runs to the water (Amblin’ again). He collapses on the sand, too drunk to continue. She swims. We see her from underneath the water. We hear Williams’ two-note theme, then (above water again) we see her body jerked around. She struggles, screams, and is pulled under. The economy of this prologue is breathtaking – nothing is wasted as time and place are established, as well as the driving threat behind the story. Hooks are set that will be exploited later: underwater is dangerous, swimming attracts danger, the musical theme indicates danger is imminent. Roger Ebert wrote the following, attributed to Alfred Hitchcock: ”A bomb is under the table, and it explodes: that is surprise. The bomb is under the table but it does not explode: that is suspense.” What Spielberg does in the first five minutes of Jaws is establish the bomb under the table; we spend the rest of the movie dreading the explosion. Next we see the protagonist, police chief Martin Brody (Roy Scheider), awaken and complain about the too-bright sun through his window – his wife tells him it was autumn when they moved in. Spielberg continues this method of exposition throughout, rarely pausing to explain anything, but dropping unremarkable (yet unmistakable) clues. In this case, we learn Brody is relatively new to his position; this is his first summer as chief; he’s an outsider. Spielberg and editor Verna Fields pace the movie perfectly. The mix of closeups and long shots, above- and underwater, short and long takes, keeps the story breezing along. Hitchcock’s influence is evident in what is suggested but not shown – the underwater monster is often represented by music, and by objects it affects. In one scene, two fishermen throw a roast into the water, chained to the dock. We see the chain pay out, then the dock is torn from its moorings. Finally, and most terrifyingly, we see the dock turn around in the water and move toward the shore. We never see the creature, but our minds conjure it far more effectively than any special effect might. Spielberg’s compositions and tracking shots continue to amaze, and have become even more seamless and fluid with this film; the virtuosity is now almost unremarkable – it’s integral to the storytelling, invisible in all but a few obvious showpieces. My favorite of those: Brody riding out to sea, viewed through a window – the camera slowly zooms out and we see a shark’s jaw is hanging in the window, and it looks like the boat is driving right into the shark’s mouth. Bill Butler’s above-water principal photography is spectacularly crisp and sun-drenched. The underwater camerawork by Rexford Metz is suitably murky, almost always looking up toward dappled sun- or moonlight. (Frequently, the camera is positioned level with the water, so we seem to see above and below in the same shot. The effect is to immerse us in the experience of the characters – we feel the water around us.) The sound design and editing are astonishing – the transitions from above- to below-water soundscapes are seamless yet transport the audience even more directly than the visuals do. Williams’ music for Jaws is arguably the apotheosis of movie scoring. This isn’t always good – his musical interpretation doesn’t consistently line up with Spielberg’s vision. When it works, as in the elemental main theme, it works gangbusters, enhancing and elevating the already superb images to something like storytelling nirvana. During the dire third act, a sprightly jauntiness is often forced on sequences that involve movement (the music says Fun! Adventure! when the characters are experiencing anything but.) When the music is good, it’s outstanding; when it’s bad, it’s way too much – it produces unhelpful (unintentional) cognitive dissonance. I didn’t care for the bells-and-whistles, pull-out-the-stops finale. Of course there’s no other way to end a film as expensive as this; order must be restored, preferably violently. Spielberg has thus far in his career displayed a sentimental habit of buttoning up his scenes with little cappers, or punchlines (like Frank Capra used to). The closing moments of Jaws display that tendency writ very large, which is a bit crass after the sublime craft that’s gone before. Still, it’s nice to see he’s tightened up his denouement after the dwindle-down finishes of Duel and The Sugarland Express (1974). Jaws is an extremely well-made, exciting film. The performances and filmmaking artistry are all best-in-class, transcending the pulp they arose from and might otherwise have remained. One of the greats. Jaws was released on June 20, 1975. The film was budgeted at $3.5 million with a shooting schedule of 55 days. The troubled production ended up costing $9 million and took 159 days, reportedly the first movie to ever run 100 days over schedule. Spielberg blames the delays on his perfectionism and naiveté – he insisted on shooting at sea, which was hell on the equipment and the actors (they were all seasick.) 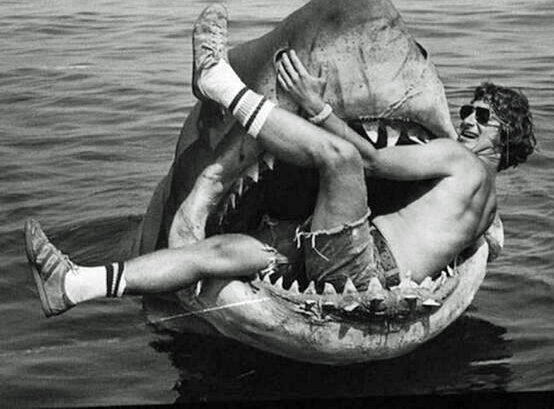 Spielberg wouldn’t go on set for the final day of shooting because he feared the crew would throw him overboard. He thought his career was finished. When Hitchock saw Jaws, he remarked “[Spielberg’s] the first one of us who doesn’t see the proscenium arch.” Watch the movie with that comment in mind – although Spielberg sometimes constructs frames for his shots (he builds the arch like Frank Capra used to), mostly the camera tracks so wildly through the action you can’t conceive how the blocking was accomplished. The script is credited to Peter Benchley and Carl Gottlieb, but many writers had a hand in. The production delays might have helped the writing, because scenes were often delivered to actors the night before they were shot. I assume Spielberg’s sensibility kept him asking for more and different until it was what he wanted. The finished product bears little resemblance to the book, despite Benchley’s credited involvement. Jaws created the template for the modern summer blockbuster. Prior to 1975, summer was a cinematic wasteland, all but abandoned by the studios (like mid-winter is today.) Back then, films tended to be released in stages, to build word-of-mouth. 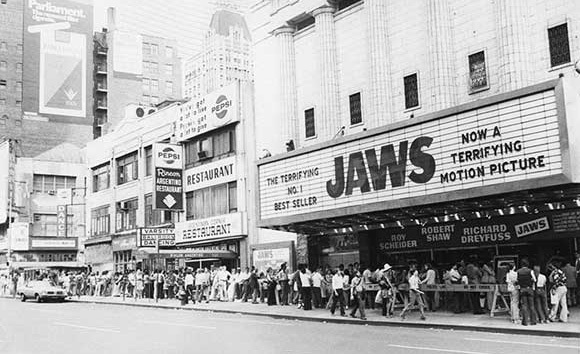 Universal released Jaws on 464 screens, huge at the time. The company spent a record $1.8 million on promotion. The film earned its expenses back in just two weeks, and went on to become the highest grossing movie ever, until Star Wars took the title in 1978. 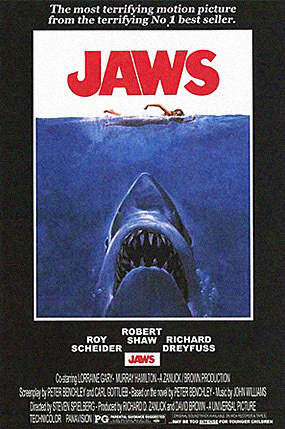 Jaws was nominated for the Best Picture Oscar (not Best Director), and scored wins for John Williams (music), Verna Fields (film editing), and Robert Hoyt, Roger Heman Jr., Earl Madery and John R. Carter (sound). Spielberg thought he was finished, but he was only getting started. Jerry Seinfeld: Get Off My Lawn!